Line up with your celebrity for the start of the Bottega. VIP parking for our loaner Lexus. The changing room was plenty roomie. Kollar chocolate instead of M&Ms or fig newtons. Cadel Evans posed for pictures all day long. Best rest stop food ever. The big climb of the day was the only portion timed on this fondo. “Hey Jimmy, is that George Hincapie?” my wife asks. “Yeah, that’s him,” I reply, stuffing another piece of Chef Chris Kollar’s delicious chocolate into my fat face. “He’s really good looking,” she pronounces. It only took 10 miles on the roads of Napa for my wife to discover what a stud George Hincapie is in person and how much I love artisanal chocolate during a bike ride. It turns out all three of the Bottega Gran Fondo rest stops will be at Napa wineries and all the food will be nothing short of spectacular. These are, I do not exaggerate here, the best rest stops we’ve ever experienced on a bike ride. As a matter of fact, not since the opening night gala of the San Francisco Symphony had we experienced such a scene. Such grandeur. Such spectacle. I know. I know. It sounds like hyperbole and to be honest it pains me to write like this. I mean, I am a journalist. I have been for almost thirty years. I hate everything and almost everybody. I assume everything is a scam and everyone is trying to give me the razzle dazzle. I am normally, some would say, a tad jaded. But from the very first moment, the Bottega Fondo experience was first class. It didn’t hurt when the premier sponsor, Lexus, dropped off one of their impeccable new NX 300h hybrids to transport the two of us and our bicycles to Yountville for the ride. If they were trying to buy my positive coverage, they were going to have to do better than just a thoughtfully appointed luxury crossover thingy. But suffice it to say, my wife was impressed enough to suggest we go test drive one at the local dealer. Starting with the Lexus and ending with the chocolate chip biscotti, every aspect of the ride ran counter to all of the organized rides of our youth. Parking spots near the start were plentiful, the bathrooms were tidy, and even though we got to the community center late, there was still hot coffee and breakfast snacks waiting for us, pre-ride. This is all due to the fact that Michael Chiarello, the famous chef behind the event, and the rest of the organizers decided to cap the number of riders at 500. Just 500 lucky participant were allowed one of these golden tickets. They also decided to not time the entire ride, just the one big climb of the day, making the staged start surprisingly civilized. It didn’t hurt the ambiance of the morning one bit to have a myriad of hot air balloons launching from a nearby golf course just as things got underway. Really, though, it wasn’t the big things like the loaner Lexus SUVs and hot air balloons that made this bike ride amazing. It was actually all the little things. Instead of just arrows at the important corners, there were young people ringing cowbells and waving orange flags. Instead of fig newtons and bananas at the rest stops there were the most amazing Ned’s Green Tea Power Cookies by Chef Ned Bell. And lamb bacon, lettuce and tomato wraps by Chef Seamus Mullen. And instead of raging testosterone-fueled aggressive riders seeking Fondo glory, the roads were filled with support, pleasantries and discussion of what culinary treat the next stop might bring. Whoever chose the route for the day was a genius route planner. Plenty of warm up, a beautiful but gut-busting KOM climb and then some of Napa valley’s best rolling roads with delightful winery views. Having attended many events where their were celebrities “in the crowd,” it was amazing how the constrained size of the Bottega put the celebrities amongst those in attendance. Andy Hampsten road past us just before the second rest stop, muttering something about being hungry. We stood shoulder-to-shoulder with Cadel Evans drinking Chef Annette Shafer’s fresh juice shots. We watched as Robin Farina hollered and cheered on her fellow riders on the big climb of the day. We spied Connie Carpenter-Phinney, Ted King, Ron Kieffel, Eros Poli on the road and even shook hands with Michael Chiarello himself as he held a lobster roll in one hand and sported a big smile on his even-better-looking-in-person mug. The ride ended in a little public park on the edge of downtown Yountville and was filled with cold beer, cured meats and delicious dishes from Michael Chiarello’s Live Fire cookbook. I, like all good journalists before me, wanted to nitpick this event. Find some fault in all these beautiful people in this beautiful place at this beautiful event. But the wife and I left impressed, exhausted and stuffed. It has taken me a couple days to digest my thoughts about the weekend and I am sure it will take me a couple more days to cleanse myself of these unusually positive feelings about the Bottega Gran Fondo. 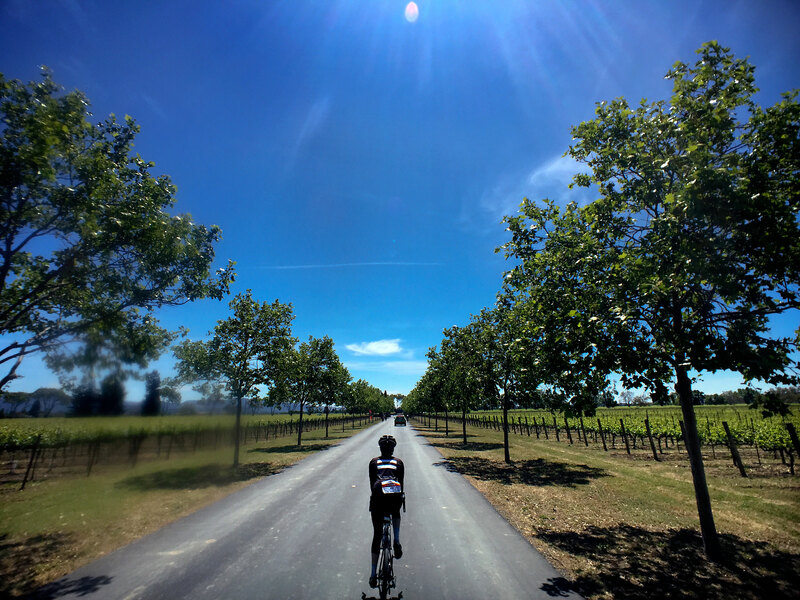 But if you are a foodie looking for a reason to visit California’s wine country, with the opportunity to ride your bike on some of the most beautiful roads in the world, then you have just been let in on the soon not-to-be-so-secret secret fest. “You think we can come back next year?” asked the wife before we even made it to the Hwy 29 onramp.